Maryland Senator Jamie Raskin will be our special guest reader at our second annual Community Read Out this Saturday, Oct. 1, from 10-noon at the Takoma Park Community Center Auditorium. Please join us for this special event, which will conclude with a pizza party, courtesy of our Friends of the Library. If you'd like to be a reader, please contact Karen MacPherson at karenm@takomagov.org or call 301-891-7259. But listeners also are very welcome! Registraiton is encouraged; to register, go to Program Registration - Takoma Park Maryland Library or call us at 301-891-7259. Parking will be limited on Thursday morning because of the installation of a sculpture at the newly-renovated park next to the Library. So Spanish Circle Time participants should consider walking to the Library this week, if at all possible. Questions? Call us at 301-891-7259. On Saturday, Oct. 1, from 10-noon, we'll hold our second annual Community Read Out in the Takoma Park Community Center Auditorium to celebrate Banned Books Week. Like last year, our event is focused on children's novels and picture books -- like Sylvester and the Magic Pebble , The Lion, the Witch and the Wardrobe and the Harry Potter books-- that have been challenged in other libraries. This is a great event for families, especially since we will conclude with a pizza party for all attendees in the Azalea Room! We still have spaces for readers; if you're interested, contact Karen MacPherson at karenm@takomagov.org or call her at 301-891-7259. But please also feel free to come and listen to some wonderful books. On Monday, September 26 at 7:30 p.m., three children's novelists will come and talk about their work. All three authors -- Tami Lewis Brown, Katy Kelly and Uma Krishnaswami -- are local, or have local ties, but also have gained national repuations for their books. For those interested, the authors' latest books will be available for purchase by cash, check or credit card, courtesy of Politics & Prose bookstore. This is a great chance for kids to get up close and personal with authors who write for ages 7-12! This program is best for ages 5 up, and registration is encouraged. To register, go to Program Registration - Takoma Park Maryland Library or call us at 301-891-7259. Thanks to the Friends of the Takoma Park Maryland Library for sponsoring this event. Includes touch-a-truck, sweet potato sculpting, board games, cardboard boxes, sing-along, dance, mud pies, an attempt to set a world record Simon Says, and lots of free and open play. Our Summer Quest program will conclude on Monday, Sept. 19 with a party for all who participated in our unique summer reading adventure. We'll talk about what books you liked, what books you hated, and what could be our Summer Quest theme for next year. We also encourage participants to come ready to talk about the things that they made or did to complete one of the Summer Quest categories. We'll conclude with cupcakes, lemonade and free books for all. To ensure we have enough goodies, please register by going to Program Registration - Takoma Park Maryland Library or calling us at 301-891-7259. We're very pleased to offer streaming e-books and audiobooks for children (and others). Nothing special is needed, just any sort of device that will connect to the Internet and has flash. PC, Mac or Linux. 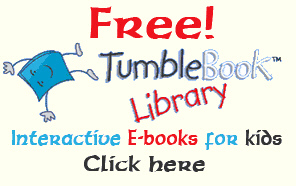 The Tumblebook Library is a large picture book collection for kids, up through grade 4 plus, and their parents. You can find many of your favorite print friends here such as Biscuit and Scaredy Squirrel. The Tumblebook Library collections come in three languages: Spanish, English and French. Look for the drop-down box in the upper right-hand corner to choose your interface language or, if you want to read/listen to a book in another language but retain the English interface, click on the language learning icon. In addition to the story books and nonfiction titles, our version of the Tumblebook Library includes some chapter books and graphic novels for elementary school students. These are labeled "read-alongs" and have a different user interface. Tumblebook features differ somewhat from book to book, but in general you will be able to turn audio on or off, turn pages automatically or manually, assemble your own collections of favorite books, write book reviews, search by author, subject area, and so on. For instructions, please watch this video. It is a bit long, but you will otherwise miss all the great hidden possibilities. When you select a book, it opens in a new tab. If you want to retain the booklists your create, remember to protect your tumblebook cookies. Games or puzzles accompany several books, so look for them and have fun. No library card is needed. This is a present from the library Friends to all the children of Takoma Park (and their parents and teachers). Our offerings for older kids and adults, Tumblereadables and the Audiobookcloud, will be introduced in subsequent posts. From School Library Journal, June 2011, quoting Julie Hume, a reading specialist. Our French Circle Time will resume NEXT week, Saturday Sept. 17 at 10:30 a.m.Due to Madame Marie's schedule, French Circle Time will take place once a month for September and October. In October, French Circle Time will be offered on Saturday, Oct. 15, at 10:30 a.m.
Help your young child learn another language with our new online language program called Little Pim. 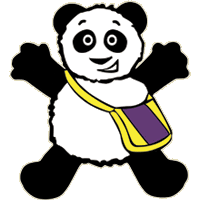 This award-winning program features a cheerful animated panda named Little Pim and is designed specifically to introduce foreign languages to young children ages one through five. You can choose from one of 10 languages: English; Spanish; French; Chinese Italian; Japanese; Hebrew; German; Russian; and Arabic. Little Pim is the star of the programs, which feature native speakers and nicely-paced, entertaining activities to make it fun and easy for kids to learn a language. We are grateful for our Friends of the Library for funding this new online resource for our youngest language learners! We've got a couple of comics-related items to share with you! First, our comics guru, Dave Burbank, will be part of a panel discussing comics and graphic novels in libraries this Sunday afternoon, Sept. 11, hosted by the Small Press Expo (SPX) at the Bethesda North Marriott Hotel & Conference Center. Other panelists include: Charles Brownstein (Comic Book Legal Defense Fund); Sara Duke (Library of Congress); Annette Klause (Montgomery County Public Library); and Caitlin McGurk (The Schulz Library). The panel will be led by Gina Gagliano of First, Second, a leading comics publisher, and will begin at 3:30 p.m. in the Brookside Conference Room. The SPX actually begins on Saturday, Sept. 10; admission is $10 for one day, $15 for both days. As Dave describes it: " If you don't know SPX, it's the nation's premier comics convention for Independent publishers. Admission is very cheap and includes access to all panels and discussions, but the most fun for those of us who like comics comes from shuffling the show floor and chatting with the eager and earnest artists and writers who are genuinely excited to meet the audience for their work." Also, our monthly Comics Jam will take place at the Library on Tuesday, Sept. 13 at 4 p.m. All are invited to our comics book club as we read together some great illustrated books on the big screen, via our ELMO document camera. Participants are invited to bring books to share during the program, which will conclude with Dave�s popular "drawing requests " segment. No registration required for this program -- just show up to have fun reading comics. Our monthly Bedtime Stories program will take place tonight, Tuesday, Sept. 6, from 7-7:30 p.m. We usually offer the program on the first Monday evening of each month, but that wasn't possible in September because of Labor Day. At our Bedtime Stories program, we sing songs and rhymes, read some stories and do some gentle movement exercises as we wind down the day towards sleep. The program is great for babies, toddlers and preschoolers and their grown-ups, and no registration is required. Kids are invited to bring their favorite stuffed animal and/or blanket; pajamas (for adults too!) are optional!